This entry was posted in News and tagged office 365, office online by Rushang. Bookmark the permalink. I have a Dell laptop with CompanionLink. In the past I had an Apple (original) iPad and CL synched Outlook 2010 on the Dell with the iPad. I bought an MS Surface Pro 2 to replace the iPad. The Surface Pro has Office 365 and Outlook 2013. CompanionLink successfully synchs Outlook 2010 (Dell) with Office 365 but I can’t figure out how to get the contacts, calendar, tasks and notes synched with Outlook 2013 (Surface Pro). The behavior I would like to have is CL synch Outlook 2010 (Dell) with Outlook 2013 (Surface Pro). I really don’t care about Office 365. Any suggestions? You can achieve this using our DejaCloud service. 1. Install CompanionLink on PC with Outlook 2010. Configure it to sync Outlook 2010 with DejaCloud (our cloud service). 2. Install CompanionLink on Surface Pro 2 with Outlook 2013. 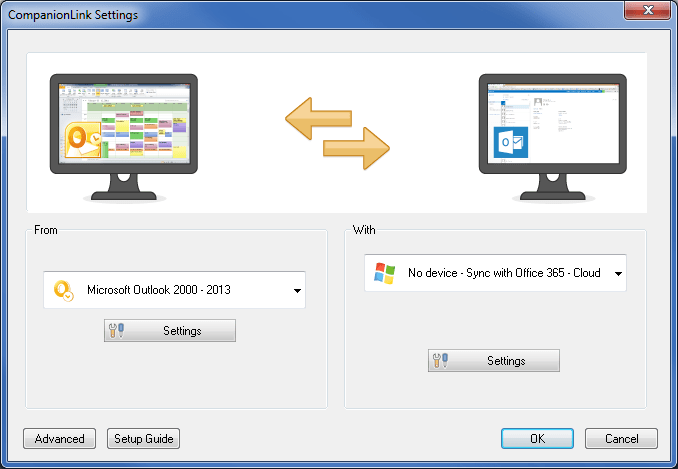 Configure it to sync Outlook 2013 with the same DejaCloud account you created in Step 1. If you need more help, please email social@companionlink.com and reference this blog article. We’re here to help.